There are five basic steps in the certification process. Application and Pledge. A company makes a written pledge that the paints they produce and sell under the certified brand name will contain less than 90 ppm total lead (dry weight). Paint Lead Content Verification. Samples from all paints sold under the certified brand name are prepared and sent for analytical testing by a laboratory contracted by the Lead Safe Paint® certification body to verify that their lead content is less than 90 ppm. The selected laboratory is one that is accredited for the analysis of lead in paint samples. Certification Certificate. The certification body reviews the analytical results and determines whether or not the brand qualifies to be certified as Lead Safe Paint®. 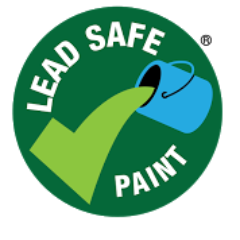 If all analyzed products conform to the Lead Safe Paint® standard of less than 90 ppm total lead (dry weight), the brand can be certified as Lead Safe Paint®. Ongoing Testing and Monitoring. The certification body will monitor the lead content of certified paint products sold in retail and/or wholesale markets on an ongoing basis. A minimum number of samples will be analyzed on an annual basis for each participating brand based on production volume.